February 8 – This morning has temperatures still holding in the lower 60s for Baltimore. It is hard to imagine that in less that 24 hours we will have a raging snow storm, but it is looking more likely. In fact the most consistent computer model has trended a little colder, which means a better chance for stickage and accumulation closer to Baltimore for the Thursday morning commute. Farther north, where it will be cold enough to maximum impact, southern Pennsylvania counties have been upgraded to a Winter Storm Warning. This just means we are more confident that there will be more than 4 inches of snow in these areas. 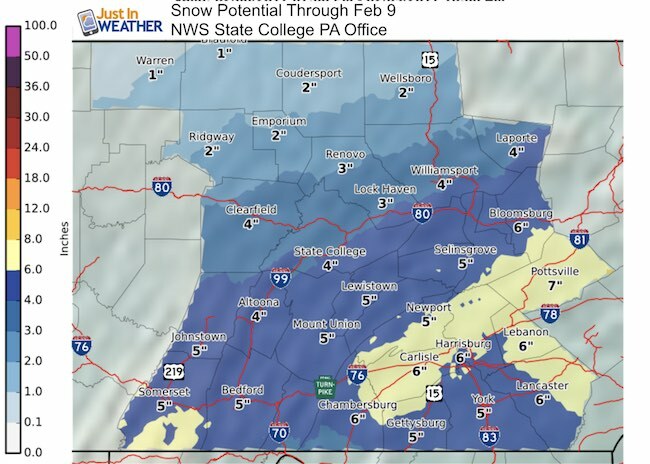 York and Lancaster are included, which is in my call for 3 to 6+ inches. This Warning has also been upgraded from the NWS office in Mount Holly, NJ the covers Cecil County in Maryland. 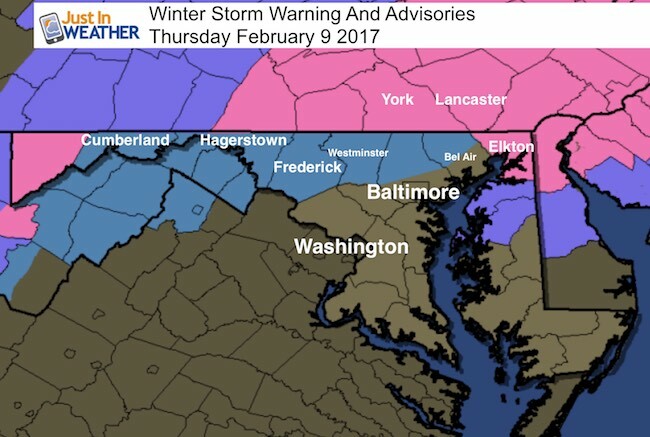 The Winter Storm Watch, and even lack of advisories in north/central Maryland are a result of the National Weather Service Office in Sterling VA. 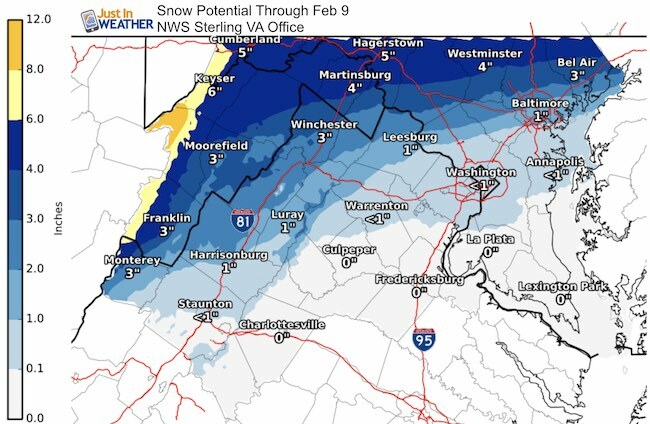 They have not made any adjustments yet, but I expect they will during the day today.Yes, I see an impact for Baltimore and possibly Washington. This will start as rain this evening and not look like much on the weather maps. But as I mentioned in my prior posts, the storm will be developing rapidly on the southern edge of the jet stream. This is called cyclogenesis. The storm will pulse just as it passes to our south, allowing moderate to heavy rain to change over to heavy snow. The heavy snow will fall before the air temperatures drop below freezing. Snow rates could reach 1 inch or more per hour. That will cool the ground down quickly and allow for stickage. Roads will get less than the grass, but should have an impact on travel during the Thursday morning commute. 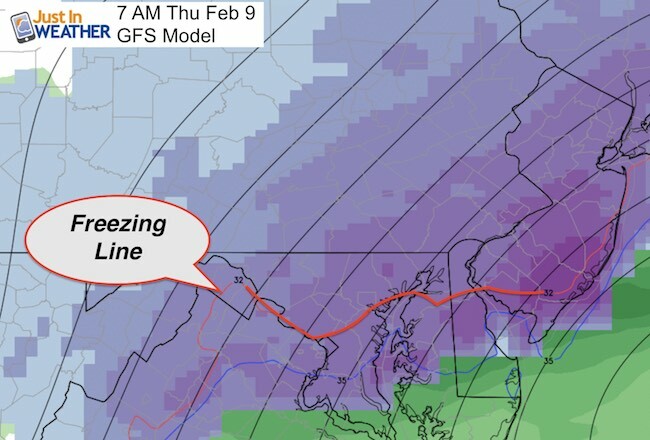 This 7 AM plot of the GFS Model highlights the freezing line. This is a little farther south than previous runs, meaning the colder air will be wining and more snow can be expected. 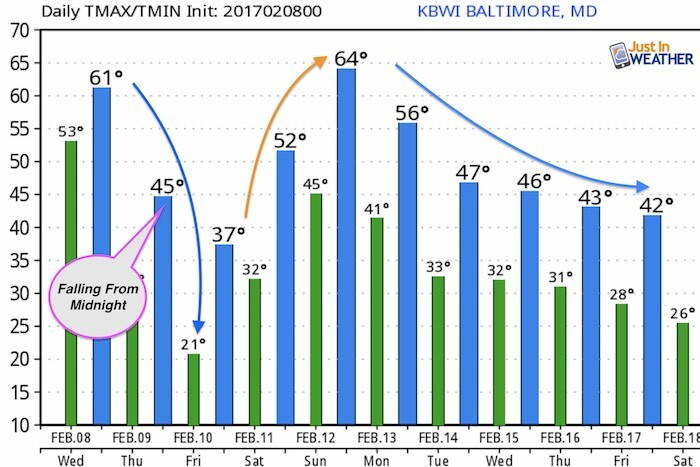 The freezing line temperatures are expected to reach through Baltimore Thursday morning. 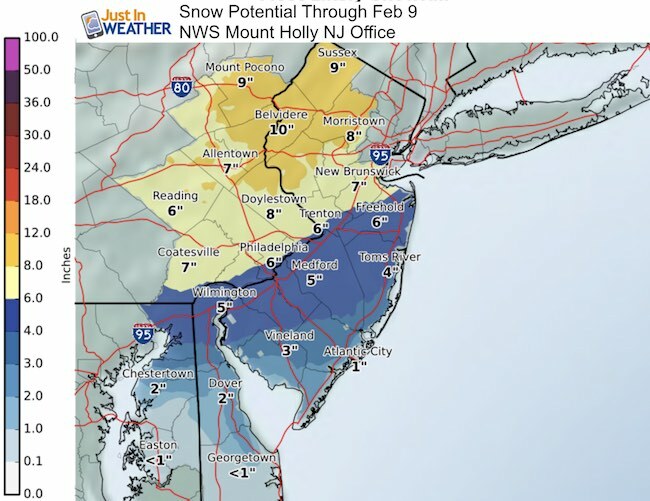 Along with heavy snow, I-95 could have accumulation at his time. 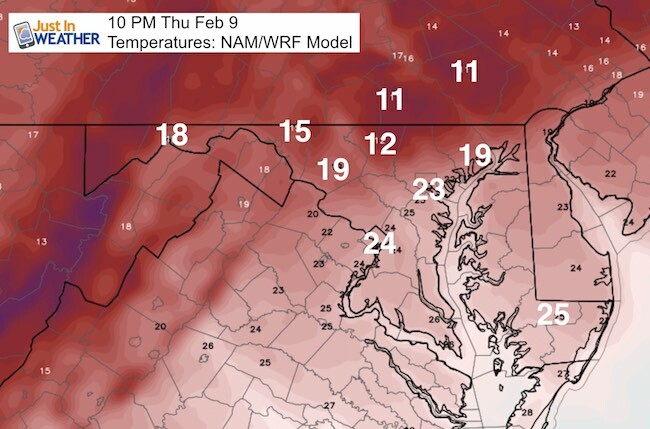 Look at the temps deep into the lower teens and 20s Thursday night. There will light snow/snow showers in the evening, so salting and maybe some light additional accumulation could require road crews to throw more salt or even push snow. There will be a quick warm up over the weekend and then a trend back to a colder pattern next week.